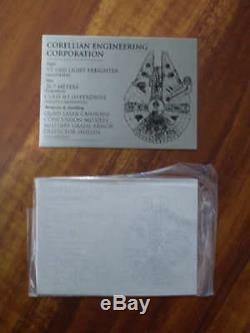 This is 100% genuine as issued by Master Replicas (not a copy or replica). 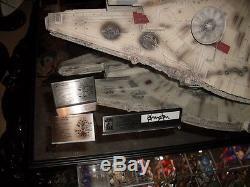 I have included a photo of my original Master Replicas plaque vs a custom plaque and circled the visible differences. 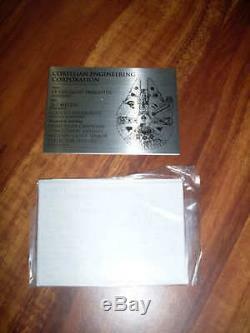 Only the metal plaque is included in this listing, exactly as obtained direct from MR. The other plaque display stands and Falcon prop in last photos are for comparison only. 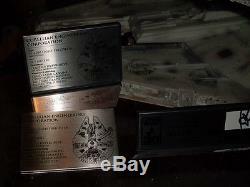 (However I also sell the matching original Master Replicas stands separately in my other auctions). In 2006 Master Replicas released the Millennium. Falcon studio scale prop and there was a spelling mistake of the word "canon" on the original plaques. (both standard and signature edition). 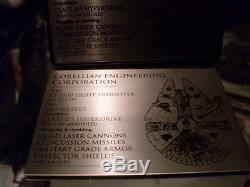 A few years after release, Master Replicas created replacement plaques with the correct spelling "cannon" and these were made available direct from MR to owners of the prop. However on the 31 March 2008 Master Replicas lost it's Star Wars licence and closed down. This plaque is brand new, wrapped in original plastic and tissue paper. Complete with reversible tape on the back of the plaque. I was lucky enough to secure all the remaining plaques direct from a former Master Replicas employee. 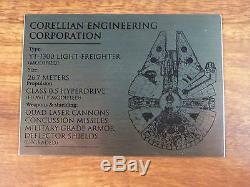 Here is a rare opportunity to add this original Master Replicas plaque to complete your existing Master Replicas Millennium Falcon studio scale prop. Also looks great on display with Hasbro Falcons and custom Falcon models. The item "Master Replicas Star Wars MILLENNIUM FALCON corrected original MR plaque prop" is in sale since Thursday, December 04, 2014. This item is in the category "Movies\Movie Memorabilia\Props". The seller is "mickfett" and is located in Campbelltown, NSW. This item can be shipped worldwide.